Following the success of the New York Times bestsellers Pogue's Basics: Tech and Pogue's Basics: Lifecomes the next book in the series: Pogue's Basics: Money which will be a timeless reference book of 200 simple tips and tricks for making managing your finances easier. This book will shed light on the best ways to save and make money. Everyone gets stressed out doing endless research to try and figure out where to get the best deals on a product, in this book David Pogue will help you spot savings and avoid costly scams. From buying plane tickets, booking hotel rooms, buying a car or house, or doing your taxes, there are tips and advice here for every financial decision you make. Instead of making uninformed or irrational decisions when it comes to money, Pogue's expertise in consumer advocacy will inform people of the best products and websites to use to save yourself money. The perfect book for holidays, Pogue's Basics: Money will be accompanied by black-and-white photographs and illustrations throughout the book, collecting all the tips and tricks in one place for you to easily access. DAVID POGUE is a New York Times bestselling author who has more than 1.5 million followers on Twitter, has given four TED talks, and is the founder of Yahoo Tech, a consumer-technology site for non-technicians. He writes a monthly column for Scientific American, and for thirteen years, he wrote the tech column for The New York Times. Pogue also hosts science shows on PBS's NOVA and appears frequently on CBS Sunday Morning. He has won three Emmys, two Webby Awards, and a Loeb Award for journalism. 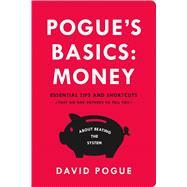 He's written eighty books, including the previous books in the series, Pogue's Basics: Life and Pogue's Basics: Tech.